Nail Polish Society: June Polish Pick Up: "Video Games"
Anchor & Heart Lacquer "Timon and Pumbaa Are Buggin" is inspired by the Super Nintendo "The Lion King" game, specifically the (super hard) Bug Toss level. This is a smokey plum purple holo with strong green to purple Aurora shimmer, green and pink iridescent flakies, and a dusting of metallic turquoise micro flakies. It had a nice formula and applied easily. Shown is two coats plus top coat. Colores de Carol "Lightning Legs" is inspired by Chun-Li, Carolina's favorite character from Street Fighter. This is a bright medium blue (cold) to colorless (warm) thermal with holographic micro flakes, Aurora shimmer, iridescent chameleon glitter, and blue holographic micro glitter. This is SO beautiful and my favorite color to clear thermal she's created so far! Shown is two coats plus top coat. Emily de Molly "Odd Strategy" is inspired by "Abe's Oddysee" (never heard of it, lol). This is a dark lilac grey with green to purple shifting shimmer and blue chrome flakes. The formula was really smooth with great coverage. Shown is two coats plus top coat. KBShimmer "Insert Coin" is inspired by old school video arcades. This is a blue to purple multichrome magnetic with a strong gold shimmer and a dusting of holo flakes. For a nice magnetic effect thicker coats work better. Shown is two coats plus top coat. Painted Polish "Sugar Rush Crush" is a saturated turquoise crelly filled with rainbow ultra-chrome chameleon flakies. I love flaky shades like this and the formula is great! Shown is two coats plus top coat. Anchor Heart & Lacquer Timon and Pumbaa are Buggin' will retail for $13 with a cap of 300. 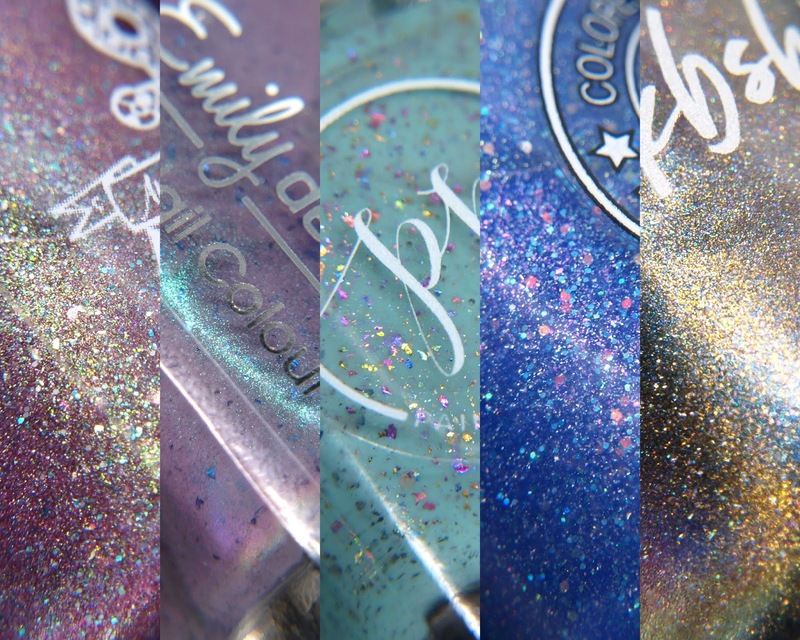 KBShimmer Insert Coin will retail for $11.50, no cap. Colores de Carol Lightning Legs will be $11.50, no cap. Emily de Molly Odd Strategy will retail for $11 with a cap of 230. Painted Polish Sugar Rush Crush will retail for $11.50 with a cap of 400. These can be purchased for a limited time through the Polish Pick Up website June 1st-4th.